Looking for something to do this weekend? Expecting or know someone expecting a baby? Showtime Productions is hosting the 7th Annual Winnipeg Baby & Kids Show! 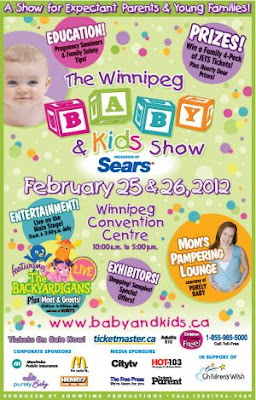 The Baby & Kids Show is geared to expectant parents and young families. NEW THIS YEAR! Our friends over at Purely Baby are hosting the "Moms Pampering Zone," which will feature massage demonstrations, mini-manicures, product samples, and take-home pampering gift bags!